Using FONEMZ, building words according to how the sound is easy for preschoolers. ​Spelling using the alphabet is also easy using the FONZABET ! She then was given a choice between a "b" the color of [b] and an "m" which is blue and asked, "Which letter do you think makes the [b] sound in the word "bat": "b" or "m"?" The two letters were compared under the FONEM for [b] and the child choses the letter "b", using the green color as a clue. 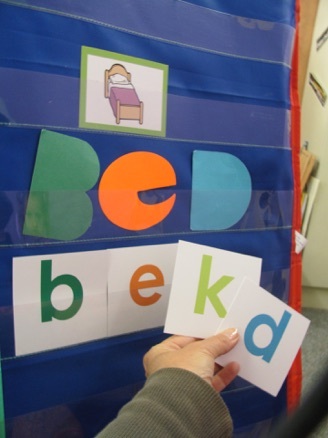 The activity continued by giving the child a choice between the correct letter and one with a quite different color until the word was spelled. Success is its own reward! After the teacher pronounced to the gleeful child that, "You are a speller!”, the word was written by the teacher, with the child's help in spelling it. When the child then read the word the teacher pronounced, "You are a reader!" The child's face filled with joy and pride! This is an incredible way to build self-esteem and the child's own perspective of him or herself as, "a reader!" 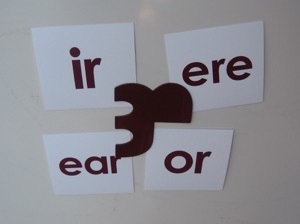 • Most phonemes/FONEMZ have more than one possible letter combination that makes that sound. 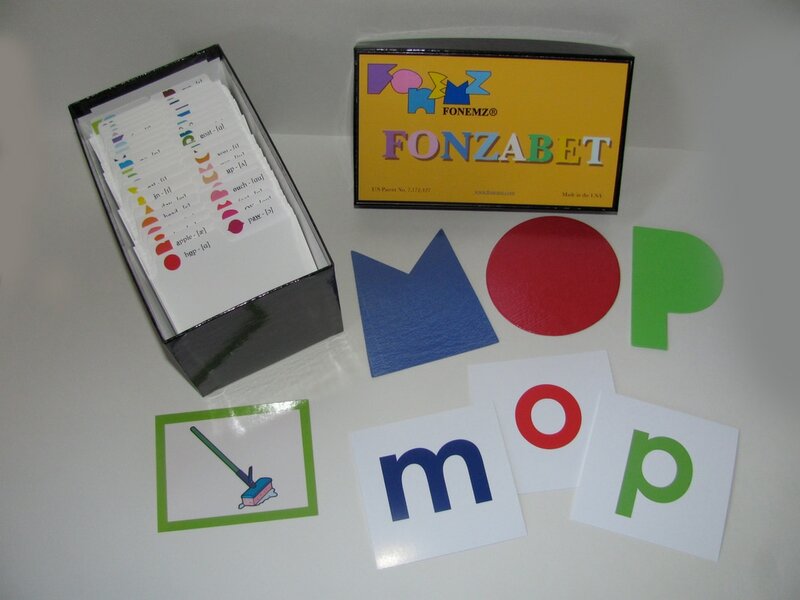 • Once students can build words with the FONEMZ, which happens quickly after they begin to recognize the FONEMZ as a specific sound, they can associate the FONZABET letters with the FONEMZ. 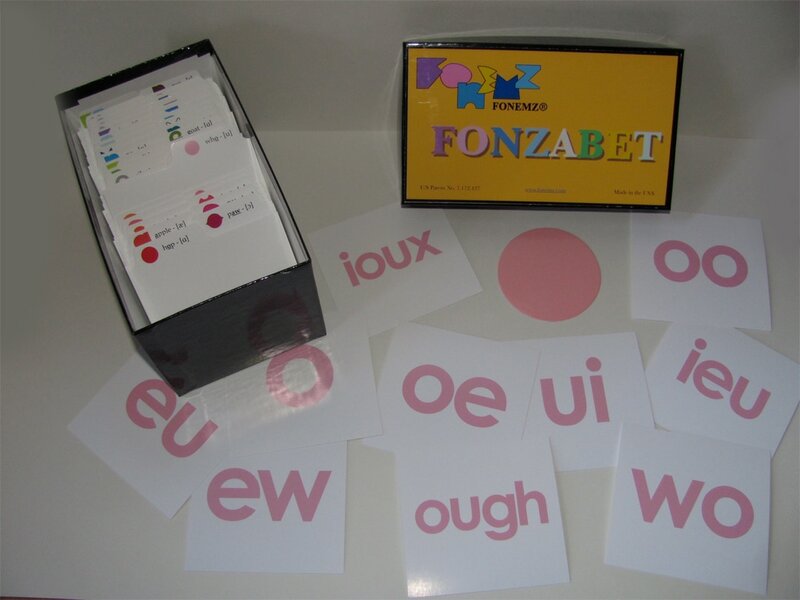 • The FONZABET consists of every orthographic combination in English for each phoneme in the color of each of the FONEMZ. • For example, there are 14 combinations of letters that "say" [u] as in "cool": o, oo, ew, wo, ough... and they are all pink like the FONEM for [u]. See pink letters below. • It is necessary for the student to learn the color relationships used in FONEMZ before a student can understand combining the colored letters used in the FONZABET. 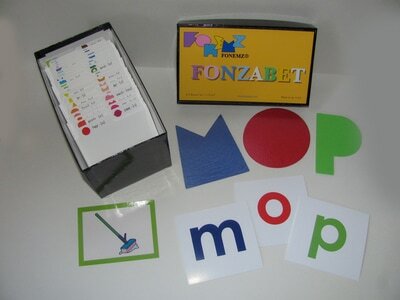 After the student can "build" words using FONEMZ, the FONZABET is the bridge between the phonemic awareness attained from FONEMZ, to letter combinations that can be substituted for FONEMZ and actually "spell" the words that we can and have already decoded by sound. Our research now shows a significant increase in beginning sound, alphabet recognition, etc. in the children who use FONEMZ and the FONZABET (many 100% by the end of the year). The following video shows deaf and hard of hearing preschool children making the transition to spelling using FONEMZ and the FONZABET. A four year old preschool girl who is hard-of-hearing learns to sound out words because she has developed strong phonemic awareness using Fun FONEMZ. The use of a pocket chart reinforces left to right progression for reading. The approach is multi sensory. She then demonstrates that she can determine what letters make the word using the FONZABET. From that she shows how she can spell and read words. FONEMZ is an evidence-based practice. By developing a person’s phonemic awareness through the use of FONEMZ, a person can then begin to learn the association with letters of the alphabet that make up the 250 letter combinations that make up the 40 sounds of English. 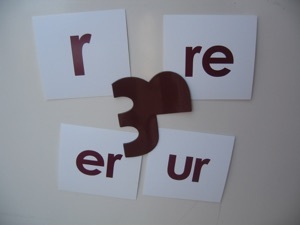 Here are examples of 8 different letter combinations that can be pronounced are “er” (as in “her”) in various word in English. Adults and and children who have never had the opportunity to speech, have a disadvantage in the development of phonemic awareness. The have not had the daily practice in speaking that reinforces that association with sounds in words. 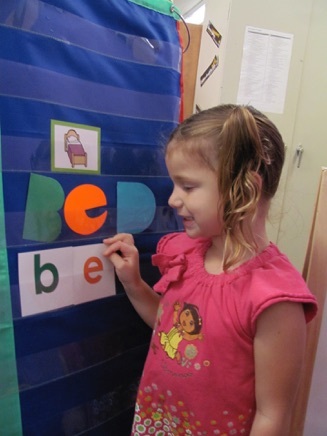 The ability to sound out words orally, is one of our most reinforcing abilities when it comes to spelling words. The use of AAC devices with predictive text programs, require that a person can spell the beginnings of words. In the following video, a girl with Cerebral Palsy, is using an Augmentative and Alternative Communication (AAC) device with predictive text. She used to have some real problems with spelling and her primary goal was to improve her spelling skills. ​When using predictive text, AAC device users must be able to determine the sounds in words. This is called phonemic awareness. Because FONEMZ are distinctively different and in the concrete form of Magnet FONEMZ, eye gaze can indicate the understanding of individual sounds. 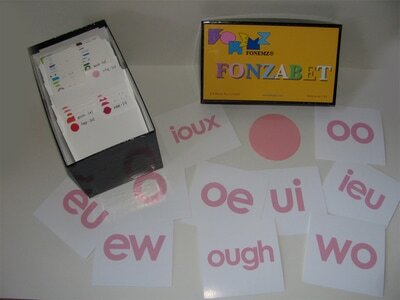 The FONZABET are cards with all the letter combinations for each sound in American English. These are color coordinated with FONEMZ. Sounding out a word is easy with FONEMZ is easy for this girl. Then using the FONZABET she shows that she can see and remember the letter combinations better. NOTE: The use of the FONZABET must start with a students ability to build a word with FONEMZ. More ideas for FELT FONEMZ, FUN FONEMZ and Magnet FONEMZ activities are in the Teacher's Guide.